Why, I could be rich. A fortune I would make. For all the time I've spent. 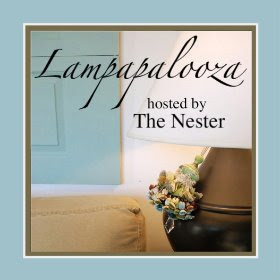 Today I'm joining The Nester and her Lampaplooza party and Goodwill is a great place to find lamps or light fixtures to experiment and update the look. Before I even knew there were people who loved to spray paint, I was always saying -"That would be cuter if it was spray painted white!" I think my family thought I went off the deep end until I found there were blogs with many, many, many other people there doing and saying the say thing. Who knew? A couple of years ago, we added onto our house to make the dining room bigger and I had the ability to get a new light. We looked and looked and I couldn't justify spending $300 for something that I wasn't really that crazy about. So in order to save money,I decided to spray paint the light fixture. The light was the lovely brass but I wanted a nice creamy color. I couldn't believe how much I like it afterwards. Again, I say - "Who knew?" I've also both several lamps at Goodwill and either left them alone or got out my spray paint. I've been trying to broaden my horizons and think beyond white or cream. It's so much fun to make something your own, don't you think? Here's the front of my house, I covered the cushion of my wicker loveseat. For some reason, the picture shows differently than how it really is. I also found a picture frame at Goodwill that I spray painted, added the burlap and the key is from Hobby Lobby! What have you done with your burlap? Yesterday, it was time to return my car that I've leased for three years. I loved that car but the gas mileage wasn't good as far as commuting to work everyday so yesterday was R-day(return day). One of the many things that I loved about it was four wheel drive, it made me confident to drive in the lovely winter conditions that we are known to have. I loved the sporty look, sitting up high, the ability to haul all of my treasures and I love the car decal that my son bought me one year for my birthday. I've looked on eBay trying to find one that's similar - but no luck. Does anybody know where I can find another one? 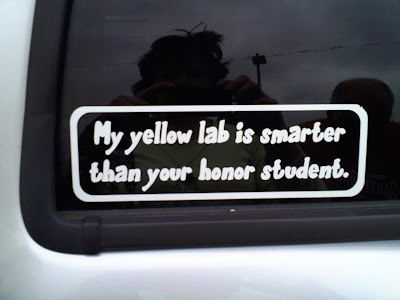 Do you have a decal on your car that shows attitude? 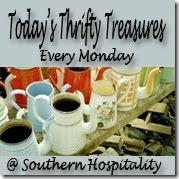 Rhoda over at Southern Hospitality is hosting her weekly thrifty treasures. Yesterday, DH and I went to Goodwill as part of our Sunday routine. We found this oak table that fits in perfectly with our other tables in the living room and it was $15! I had been on the look out for a table to hold the Willow Tree figurines that I have also found at Goodwill in the past. All it needed was some Pledge and it looks like I've always had it. I've also found some great books at Goodwill too - they fit nicely in my round basket. I'm also working on my burlap project for Crazy for Burlap party on May 28th. Is anyone else watching the Jon & Kate Plus 8 all weekend? When I was in school (grade & high school), I played the clarinet and I loved when we played patriotic music. I couldn't get enough of John Phillips Sousa music (okay, I was a nerd), and to this day, I still love his music because it reminds me of parades and and the soldiers who fought for our freedom. My senior year in high school, I took (borrowed) a piece of music from band. It's been 30 years since I was in high school but I still have that piece of music and I know where it's at. 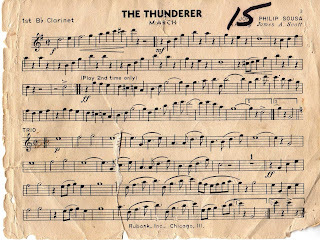 The music is "The Thunderer" by John Phillips Sousa and it's still one of my favorite patriotic songs.Looking at it today, I can't believe that I had the song memorized, I don't have my clarinet anymore but I have still have this music. It's Foodie Friday and and I'd like to share one of my family favorite recipes. When my daughter was getting married, her wonderful future mother-in-law gave her a recipe book that needed to be passed around so everyone could add their favorite recipes and have it in their handwritten. This was one that I added to her book and I hope you like as much as we do. Fry hamburger with some diced onion. Drain grease and add remaining ingredients. (Make sure to get boullion cube broke up and mixed in good.) Heat until warm and thicken with flour as desired. 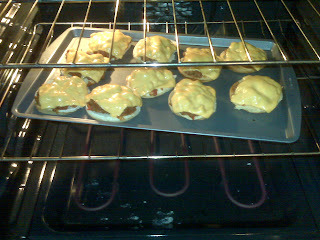 Open hamburger buns on cookie sheet and top with meat mixture and add a slice of velveeta cheese. Be sure to stop by and check out the other great recipes at Designs by Gollum. I love going to Goodwill, looking at all of the things and remembering when I had the very same things. Sometimes I wonder what I was thinking and it's weird that those very same items are considered vintage or the dreaded antique. I saw this item one afternoon and picked it up and really wanted it but couldn't decide where I would put it. So in a rare moment of being aware that I didn't need to have everything that I want at GW, I put it back. Then I came home and read blog after blog about monogram things and I knew I made a mistake by not taking it home with me when I initially saw it. Several days later I went back to GW on a mission - to find that thingie! What was the chance that it would still be there? Certainly someone else would have scooped it up. I searched and just when I was about to give up, I found it!! I decided the M stands for "Mom." 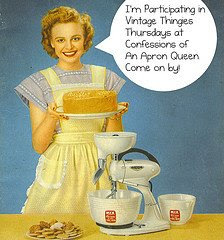 Check out all the other Vintage Thingie Thursday over at Suzanne at Colorado Lady. I found a white sugar bowl and it was cute but it had a chip on it andI know that if I'm patient - I'll find exactly what I'm looking for, so I left it there for someone else. As I've said before, I'm always amazed at what people give away - of course, I'm not complaining - just amazed at what people get rid of. I've learned to head right over to the book section before going anywhere else. This weekend I found several books that were like brand new and cost $.75 a piece! Are you kidding me? I usually get to the store and someone else has filled their cart with books - bit this time I scored! While I do get most of my books at the library - $.75 a book, I can't imagine not picking up these books. I love to read Debbie Macomber books and got my daughter hooked on her so I always look for her books and I scored again this weekend! But I'm not one to be satisifed with just taking books home with me - I went to the other GW store. I always find something wonderful and yesterday was no exception. A couple of cute pillows to put out on the back covered deck. Gold sunflower watering can - spray paint project -this is going pink! Cute angel hanging - already hanging in my kitchen. But my best find was this lamp - I seem to gravitate to lamps..is it shabby chic or what? And I got it for $4! Be sure to stop over at Southern Hospitality and check out the other thrify finds - it's so much fun to see what's been found! A couple of years I found one of those picture frames that hold lots of different size pictures. I bought it for my youngest daughter but she put her nose up in the air when I showed it to her. So I put it under the steps - where everything gets put when we don't know what to do with it. I've been hanging onto that picture frame wondering what I would do with it because the frame is really cute. There have been so many blogs out there showing cute things done with chalkboard paint so I finally decided to give it a shot. Yeah - we're having steak and baked potato tonight!! Laurie's Angels - The Bracelet! Yesterday, I posted a story of a single mom in my town who has ovarian cancer. Laurie doesn't have any health care benefits and her daughter is making bracelets to help raise money for them. 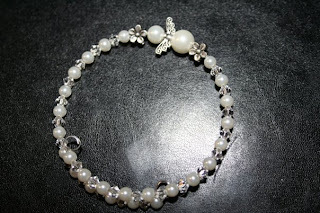 The bracelet has pearl and crystal beads, then silver flower, pearl for head of angel, silver angel wings, bigger pearl for body of angel followed by another silver flower bead... it's very sweet and it can be yours for $10. To buy a bracelet or make a donation, email Ashlie Wingate at lauriesangels@gmail.com. Holidays are always a special time to get together with family. But when a loved one is ill with a life threatening disease, holidays can be bittersweet. On the news last night, I saw a story about a mother/daughter who lived in the same town I live in that I wanted to share their story. It's a day to celebrate the mothers in our lives, but one family is trying to do that every day, because they know their Mom may not be around next Mother's Day. Ashlie Wingate and her mother, Laurie Nelson, both of Brandon, have a typical mother-daughter relationship; not always easy during the teen years, but they grew a lot closer as adults. "We've definitely had our trials but now that she's grown up, she realizes maybe mom was kind of right," Nelson said. Right about a lot of things, but even as a nurse, Nelson couldn't have imagined what was going on when she came down with something last spring. "We thought it was pneumonia. We went out for dinner one day and she just couldn't breathe, she goes, I think I have pneumonia, I get it this time every year," Wingate said. But the family was shocked to learn it was stage four ovarian cancer. Doctors removed 95% of the cancer, but still gave Nelson one to two years to live. "I have good days and bad days, and hopefully I'll start having good days again," said Nelson. The diagnosis was about a year ago, and now, Nelson has just finished her last round of chemotherapy. It's been a difficult year for this single mother, but she and her daughter have only grown closer because of it. "She's pretty amazing;, she's been a rock, that's for sure," Nelson said. Aside from the physical pain, Nelson is also financially strapped because she doesn't have health insurance. She says when she was diagnosed, she was just finishing nursing school and only working part-time. Wingate watched the bills pile up while her mom got sicker, and decided to try and help with expenses by making and selling these bracelets. She calls them "Laurie's Angels." "I would see these plastic bracelets and think, why not make something prettier for moms, daughters, friends. It's a little guardian angel, and you can have it with you wherever you go," said Wingate. "She knows I love angels, they're kind of my thing, so it was perfect," Nelson said. Wingate started the project about two months ago, and has already sold quite a few by word-of-mouth, and also with the help of Visual Images in Brandon. The salon has agreed to set up a basket and sell the bracelets for $10 a piece. "I'm looking for more places to set up a basket with them," said Wingate. Besides just helping pay off some bills, Wingate also wants to spread the word about ovarian cancer. "It's usually caught too late. In my mom's case, they said it probably grew within six months to stage 4, and she didn't know about it," Wingate said. "It also reminds me to tell other women about ovarian cancer, because it is a silent killer," said Nelson. And while this family works so hard to beat the cancer, Wingate says her angel, is her mother. “She's a hero, through and through,” said Wingate. “I've watched her through so many challenges, she's so brave and she's a great role model." Wingate is hoping that ovarian cancer won't take her mother too soon, and Nelson says the experience has taught her to appreciate her family. "Never take away that time to say I love you, because you may never know when you'll have it again," said Nelson. To buy a bracelet, help sell them, or make a donation, email Ashlie Wingate at lauriesangels@gmail.com. I encourage everyone to watch the video and order yourself a bracelet. Miracles can and do exist. What a busy weekend this turned out to be. Every Mothers Day weekend our town has their city wide rummage. This year there were 292 rummages and it was busy, busy, busy! Because we put in new carpet in the lower level and then decided to paint the exterior, we've been living in chaos for the past three weeks. But it did make it helpful to work on reducing what came back into the house. Then because we had a newly painted and carpeted family room, we decided it was time to get some different furniture. While the rummage was going on, the furniture was delivered. Talked about stressed..I'm so glad that Crystal was there with me. After the rummage was over on Saturday, Crystal and I dropped off our donations to Goodwill and of course we had to go inside and see what we could find. This huge white popcorn bowl.. I'll be posting a couple of projects later this week.I'll show why DH needed white spray paint...he's coming around and understanding that spray paint is the way to go..and also a project that I did with chalkboard spray paint - it turned out really cute!